Paul deLay's untimely death a decade ago at the age of 55 seemed a cruel trick of the cosmos. His death stilled one of the most original voices in all of blues, an artist at the height of his powers, who transcended notions of black or white; of authenticity; who existed on a plane of pure emotion and invention. He didn't write standard blues songs, nor was he part of the herd of blues harmonica players, some of whom perhaps gravitate to the harp because of its portability and simplicity. Few if any of those could play a diatonic harp solo as concise and cliché-free as deLay's on “Wealthy Man.” As for the jazzy calliope of his chromatic harp over the bass-driven funk of “Nice and Strong” – well, there's no one else in the blues world who can do that. And his voice – he had no business being the great singer he was, thanks to pipes that recalled Andy Devine's more than your stereotypical blues shouter. But there it is: deLay was – is – great because he was never a stereotype. Instead he was a funny, intelligent, basically shy man who was a great blues musician because he was unafraid to open the conduit to his heart and soul. And he was backed by a superb band that could essay the way-beyond-12-bar-blues complexity and subtlety of his songs; compatriots who believed in deLay and his music. You can hear all that on this just-discovered recording of deLay and his superb band at their peak, in front of a crowd of enthusiastic Norwegians at the 1997 Notodden Blues Festival. It's a completely unexpected bonus, and perhaps a bit of cosmic recompense for deLay's untimely departure, that this recording came to light on the 10th anniversary of his departure, and 20 years after this performance. 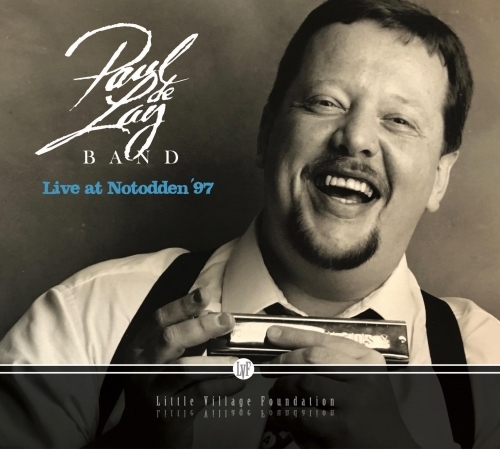 Back in 1998, the Notodden festival released a 10th anniversary compilation CD which included, “What Went Wrong” by the Paul deLay Band. That was a nice surprise, as the band hadn’t realized their set was being recorded. Plus they felt honored to be included on a CD with blues artists including B.B. King, Luther Allison, and Robert Cray. But that's as far as it went, a pleasant surprise, until a year ago, when Louis Pain and Peter Dammann got to wondering whether a recording of their complete ’97 set might exist. It turned out that the deLay Band’s performance was still fondly remembered by Notodden festival goers, including current festival General Manager Jostein Forsberg, who had been a performer back in ’97. Remarkably, Forsberg was able to track down a recording of the set. Listening to this CD, it’s no surprise that the performance was still remembered by Norwegian blues fans: from the ascending intro of “Come On with It” to the rolling lilt of “Love on a Roll,” the band and deLay serve notice that this hour is all theirs. You'll soon find your own favorite parts. Singer/songwriter/harmonica player Paul deLay (January 31, 1952-March 7, 2007) never achieved much popular acclaim beyond the Pacific Northwest, but he is internationally revered among blues cognoscenti and performers - harmonica players in particular. The unexpected discovery and release of this stunning live recording is likely to create wider awareness of this remarkable talent, his powerful band, and the compellingly original repertoire they crafted. deLay would have been a superstar." Click HERE to order your own copy of this outstanding newly released recording. Little Village Foundation is an award-winning non-profit cultural producer and record label.